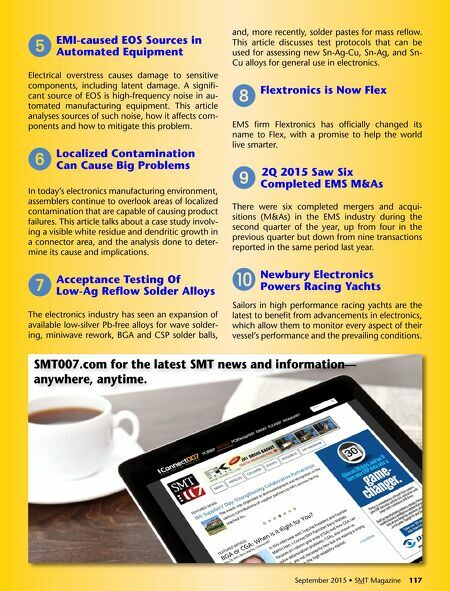 September 2015 • SMT Magazine 117 5 emI-caused eOs sources in Automated equipment electrical overstress causes damage to sensitive components, including latent damage. a signifi- cant source of eoS is high-frequency noise in au- tomated manufacturing equipment. This article analyses sources of such noise, how it affects com- ponents and how to mitigate this problem. 6 Localized Contamination Can Cause big problems in today's electronics manufacturing environment, assemblers continue to overlook areas of localized contamination that are capable of causing product failures. This article talks about a case study involv- ing a visible white residue and dendritic growth in a connector area, and the analysis done to deter- mine its cause and implications. 7 Acceptance testing Of Low-Ag reflow solder Alloys The electronics industry has seen an expansion of available low-silver pb-free alloys for wave solder- ing, miniwave rework, bga and cSp solder balls, and, more recently, solder pastes for mass reflow. This article discusses test protocols that can be used for assessing new Sn-ag-cu, Sn-ag, and Sn- cu alloys for general use in electronics. 8 Flextronics is Now Flex eMS firm flextronics has officially changed its name to flex, with a promise to help the world live smarter. 9 2Q 2015 saw six Completed ems m&As There were six completed mergers and acqui- sitions (M&as) in the eMS industry during the second quarter of the year, up from four in the previous quarter but down from nine transactions reported in the same period last year. J Newbury electronics powers racing yachts Sailors in high performance racing yachts are the latest to benefit from advancements in electronics, which allow them to monitor every aspect of their vessel's performance and the prevailing conditions. 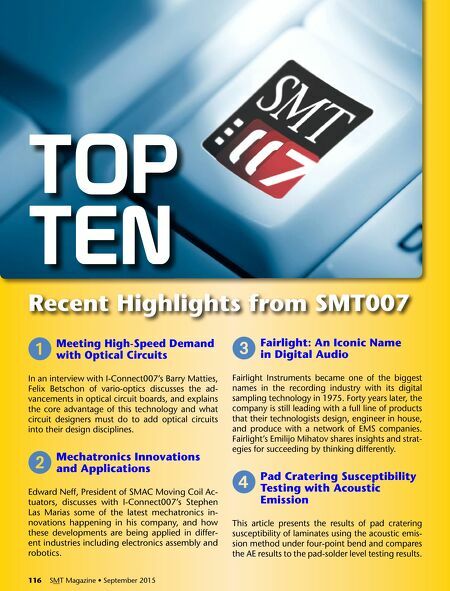 September 2015 • SMT Magazine 117 smt007.com for the latest smt news and information— anywhere, anytime.